The "Robinson's Island". 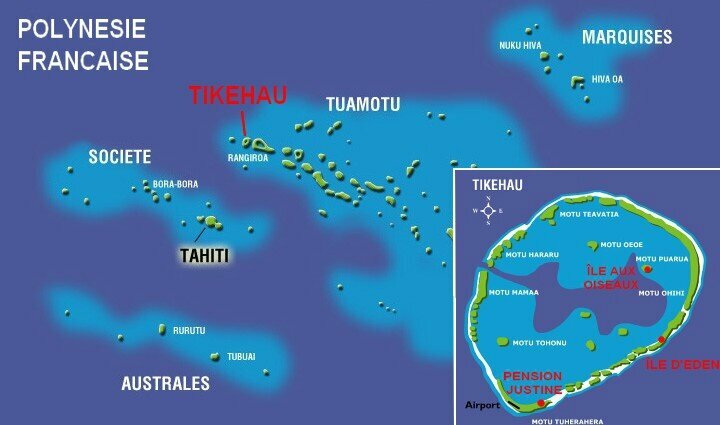 This oval shaped atoll located some 300 kilometers to the northwest of Tahiti, about a dozen kilometers from Rangiroa, has a large pass and a series of islets, the largest of which at the south west of the atoll, 900 meters wide and inhabited. The charming village of Tuherahera, swathed in flowers, is situated on the south end of this large motu which also has two other villages : Tuheiava, an important center for lagoon fishing and the many fish parks that supply the markets of Tahiti, and Maiaia on the other large motu on the northeast that is a traditional copra producer. The beauty and abundance of its fauna account for the popularity of scuba diving especially in the Tuheiava pass, where the manta rays' dance alternates with the parades of shoals of barracuda, and tuna fish, not to mention the gray and the white-tipped sharks. One of the most beautiful atolls in Polynesia is also home to many bird colonies that have sought refuge in the small motu, including the aptly named Isle of Birds well known for its red-footed gannets and brown noddies. 1000 CFP francs = 8.38 euros. No banks or ATM's here.